React introduced new static method getDerivedStateFromProps(props, state) which is called before every render method, but why? Calling it after prop change makes sense to me but after setState it doesn't, maybe I am missing something. I was creating a datePicker Component according to my company requirement, in the component date is controlled from the prop. I have the following state in the component. selected represents selected date which is derived from date prop and currentMonth and currentYear represents month and year in the current calendar view. If date from prop changes selected*, currentMonth and currentYear should be changed accordingly. For that, I am using getDerivedStateFromProps but let say user clicks on Month name which will switch calendar view to month (instead of dates name of the month will be shown), the function updates the currentMonth for this using setState, but date the prop is same as before (containing previous month) which should, but getDerivedStateFromProps is called and currentMonth is again as same as before instead of changing. Right I creating an extra variable in state to track if getDerivedStateFromProps is called due to setState but I don't think that's the right way. Either I am doing something wrong or missing something or getDerivedStateFromProps should not be called after setState. Probably I am doing something wrong. I also got that issue. So I set another variable to check is that prop received for the first time. if you want to use multiple props values you need to set your if statements (or any other logic) accordingly. you have the answer in your question itself. "which is called before every render method". Whenever you do a setState the render method will be called. I would suggest that you lift the state variables currentMonth and currentYear to the parent component and pass them as prop along with other three. You can also pass the change handler as prop and call it from the child. on initial render - currentMonth and currentYear can be set to null, so that you can have the logic for showing default stuff. When someone chicks on month name, you can call the changeHandler from parent which will pass the new prop. Now in getderivedstatefromprops you no longer have currentMonth and currentYear as `null so you know that the month has changed. The way getDerivedStateFromProps hook works whenever the new props, setState, and forceUpdate is being received. 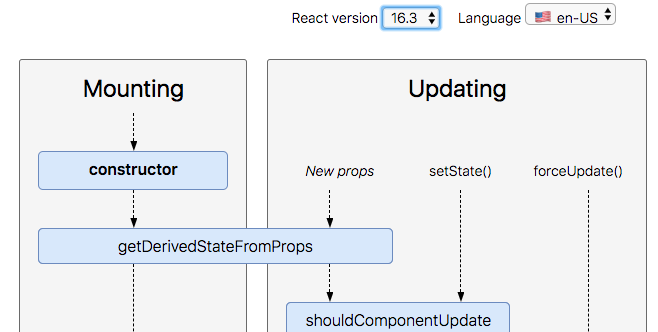 In the version of 16.3, React is not affecting getDerivedStateFromProps whenever the setState is being used. But they improved it in the version starting with 16.4, so whenever the setState is being called the getDerivedStateFromProps is being hooked. // check your condition when it should run? Not the answer you're looking for? Browse other questions tagged reactjs getderivedstatefromprops or ask your own question. Why is setState in reactjs Async instead of Sync? Will setState inside componentWillReceiveProps run before render? Do we need to make sure getDerivedStateFromProps is not recursive?